Don’t Forget the Sprayway! » Embroidery Talk Has Moved! Sometimes the most basic stuff is the stuff that’s easiest to forget. If you run a machine embroidery business, you don’t want to forget about Sprayway products. These sprays are very useful for any shop and can save you a lot of problems and hassle. 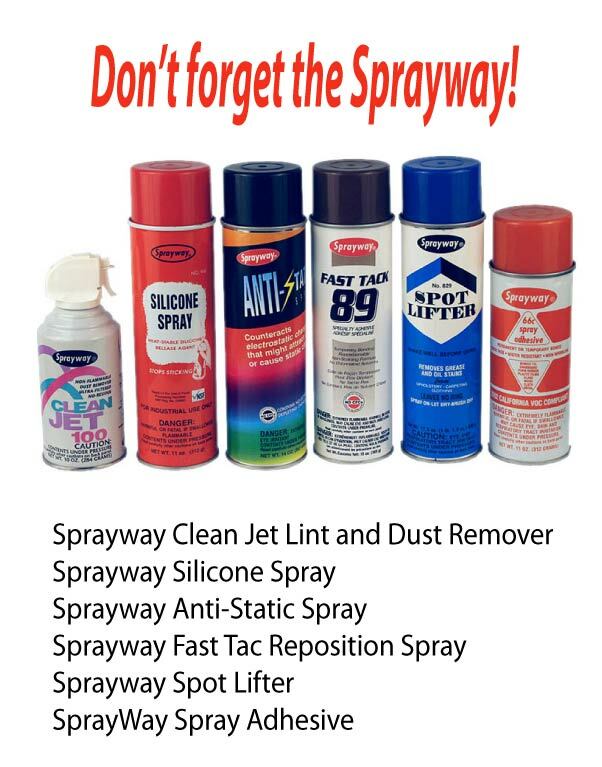 If you haven’t checked out our Tools and Accessories section lately, here’s a little refresher course on what Sprayway products can do for you. Sprayway Anti Static Spray – This spray helps counteract static electricity charges that can attract dust to you machines. It can also be used on fabric to help eliminate static cling. This spray can also be used to prevent static electricity shocks which could damage a computer memory. Sprayway Clean Jet Lint and Dust Remover – This is essentially “canned air”. It can be used to clean small or delicate areas in your embroidery machine. Use it remove lint from bobbin cases. 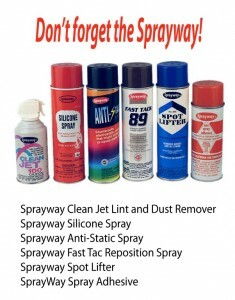 Sprayway Fast Tack Reposition Spray – If you don’t want a permanent adhesive, this is the spray for you. You can use this spray to make regular backing into an adhesive stabilizer. This is non staining and non transferable. Sprayway Silicone Spray – This product stops sticking and binding and protects your machines. Silicone spray can also be used to speed fabric flow and reduce friction. Sprayway Spot Lifter – If you’ve ever had to discard a piece of fabric because you got a spot or a stain on it, this product is for you. Spot Lifter removes stains from cloth. It is safe and effective when used on cotton, wool, synthetic materials and silk. Spot Lifter is also guaranteed not to stain the cloth. Sprayway Spray Adhesive – For temporary bonds, look to Sprayway Fast Tack. For more permanent bonds, try Sprayway Spray Adhesive. This product bonds to foam rubber, cardboard, plastic, glass, wool, cloth and metal. It has a quick and long lasting tack and is water resistant. For those of you who work in shops where MSDS sheets are required, I would also like to point out that EnMart offers downloadable MSDS sheets for all Sprayway products on our web site. Just click the MSDS link on the top menu bar to see the list. This entry was posted on Wednesday, August 4th, 2010 at 11:22 am and is filed under Machine Embroidery Supplies. You can follow any responses to this entry through the RSS 2.0 feed. Both comments and pings are currently closed. You are here : Home » Don’t Forget the Sprayway!